BRISTOL, Tenn.—After spinning his strongest challenger on Lap 219, Kyle Busch held off Jason Leffler and polesitter Elliott Sadler through a spate of cautions in the closing laps to win Friday night’s Food City 250 Nationwide Series race at Bristol Motor Speedway. Busch won his 10th Nationwide race of the year, tying the single-season record he already shared with Sam Ard. The victory was Busch’s 40th in the series, but it was not without controversy. Busch can complete an unprecedented sweep of three races at one track in NASCAR's top three touring series with a victory in Saturday’s Sprint Cup Series Irwin Tools Night Race. 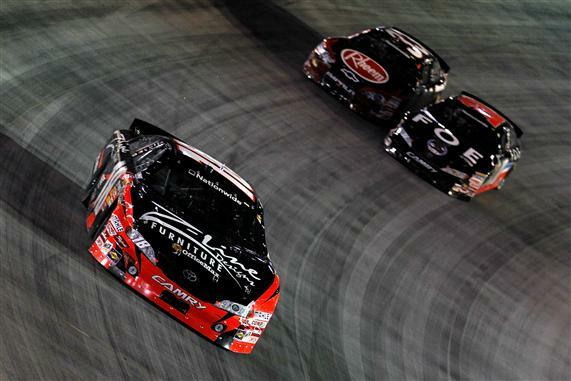 Busch won Bristol’s Camping World Truck Series race Wednesday night. Keselowski and Busch battled ferociously for the lead during the final quarter of the race, and that heated contest produced the sixth caution of the event. On Lap 219, Busch slid past Keselowski for the lead off Turn 2 but bobbled slightly down the backstretch. Busch’s No. 18 Toyota clipped the wall after contact from Keselowski’s Dodge, and as the cars rolled through Turn 4, Busch spun his adversary in the corner, forcing Keselowski to pit to repair the damage to his car. Keselowski finished 14th. Busch admitted he spun Keselowski on purpose. “I thought I had him cleared on the back, and I moved up in front of him, and instead of him doing an Earnhardt crossover move, he just decided that he would run into the back of me and put me in the fence,” Busch said. “That’s Brad Keselowski. So I went into the next corner and dumped him. Dale Earnhardt Jr. rallied from a lap down to finish fourth behind Leffler and Sadler. Carl Edwards ran fifth. Trevor Bayne, Clint Bowyer, Reed Sorenson, Parker Kligerman and Joey Logano completed the top 10. Edwards, second in the series standings, trimmed Keselowski’s lead to 313 points. On the strength of his 10 victories in 20 starts, Busch remained third in points, 434 behind Keselowski, despite having competed in four fewer races than either Keselowski or Edwards. The race featured a wild accident on Lap 83, when contract from Justin Allgaier’s Dodge sent Kasey Kahne’s No. 38 Toyota sliding on its side along the outside wall for approximately 200 yards. Notes: Busch gave Toyota its 50th Nationwide win. … Busch won in chassis 61, which has accounted for eight victories in 10 starts. … Busch’s 40 wins have come in 193 starts. He is second to Mark Martin, who has 48 wins in 231 starts.